NIST/JILA biophysicist Tom Perkins used this atomic force microscope to measure protein folding in more detail than ever before. BOULDER, Colo.-- Biophysicists at JILA have measured protein folding in more detail than ever before, revealing behavior that is surprisingly more complex than previously known. The results suggest that, until now, much about protein behavior has been hidden to science—happening on faster timescales and with finer changes in structure than conventional methods could detect. Protein molecules are chains of amino acids. They fold into three-dimensional shapes that determine their function through a series of intermediate states, like origami. Accurately describing the folding process requires identifying all of the intermediate states. The JILA research revealed many previously unknown states by unfolding an individual protein. For example, the JILA team identified 14 intermediate states—seven times as many as previously observed—in just one part of bacteriorhodopsin, a protein in microbes that converts light to chemical energy and is widely studied in research. “If you miss most of the intermediate states, then you don’t really understand the system,” he said. Knowledge of protein folding is important because proteins must assume the correct 3-D structure to function properly. Misfolding may inactivate a protein or make it toxic. Several neurodegenerative and other diseases are attributed to incorrect folding of certain proteins. Over the last 50 years, protein folding has become the focus of a large, interdisciplinary research field. Significantly, bacteriorhodopsin is a membrane protein that resides in the boundary between the inside and outside of cells. As a class, membrane proteins are much larger and more difficult to study than globular proteins, which are the focus of most protein folding research. JILA researchers used a specially modified atomic force microscope (AFM, top) to pull on and unfold a protein embedded in a membrane (bottom). 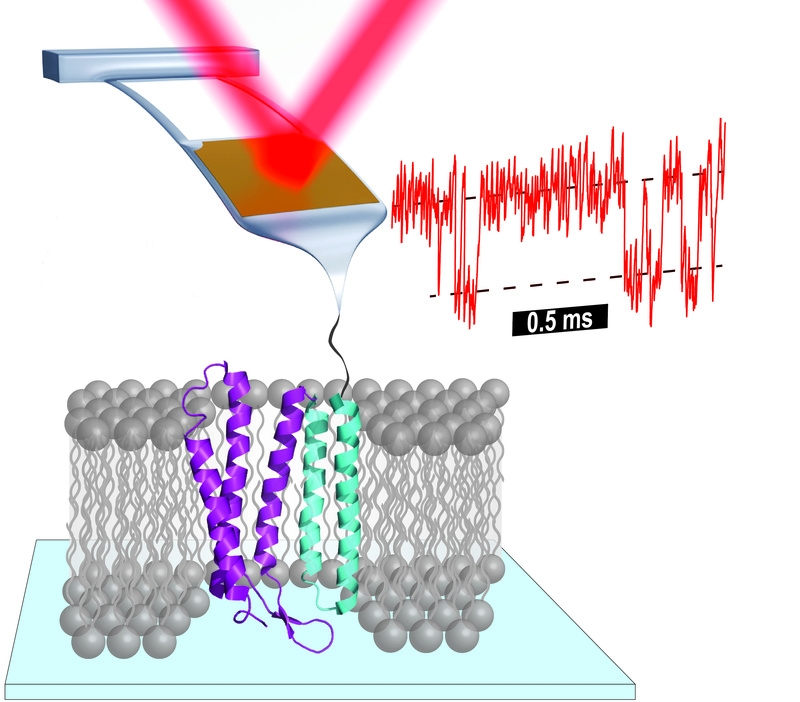 Changes in protein structure bend the AFM tip, as detected by the red laser. Researchers measured many previously hidden changes in the protein’s 3D structure. For example, measurements of just one small part of the protein (right) revealed unfolding and refolding between two intermediate states (dashed lines) over less than a millisecond. As described in the March 3, 2017, issue of Science, Perkins and colleagues used an atomic force microscope (AFM) to stretch bacteriorhodopsin and measure its extension (in nanometers) at various pulling speeds (measured in nanometers per second). The new measurements were made possible by JILA’s prior development of short, soft AFM probes, which quickly gauge abrupt changes in force—signaling an intermediate state—as a protein unfolds. Further refinements of these probes allowed JILA researchers to probe bacteriorhodopsin 100 times faster (in 1 microsecond) and with 10 times the precision in pulling force of prior work. The JILA team found that intermediate states were not only more numerous than expected but also lasted as little as 8 microseconds. The findings resolved long-standing discrepancies between past experimental data and molecular simulations, giving confidence to using such simulations to further probe the behavior of membrane proteins. The JILA team’s discovery and techniques could be applied to many other molecular studies, including those of medical interest such as interactions between proteins and medications. More specifically, bacteriorhodopsin’s structure is similar to that of proteins involved in many human diseases and targeted by many medicinal drugs. The research was supported by the National Science Foundation, the National Institutes of Health and NIST. Paper: Hidden dynamics in the unfolding of individual bactriorhodopsin proteins. 2017. H. Yu, M.G.W. Siewny, D.T. Edwards, A.W. Sanders and T.T. Perkins. Science. March 3. Vol. 355, Issue 6328, pp. 945-950, DOI: 10.1126/science.aah7124.